Tonight's Dirty Dining brings us a brand new member of the 50-plus club. LAS VEGAS (KTNV) — Tonight's Dirty Dining brings us a brand new member of the 50-plus club. That's a not-so-distinguished list of restaurants that have gotten more than 50 demerits on a health inspection. And if that number isn't enough, 13 Chief Investigator Darcy Spears is calling this week's restaurant report the Dirty-Niner because she's got nine places to tell you about on air and online. 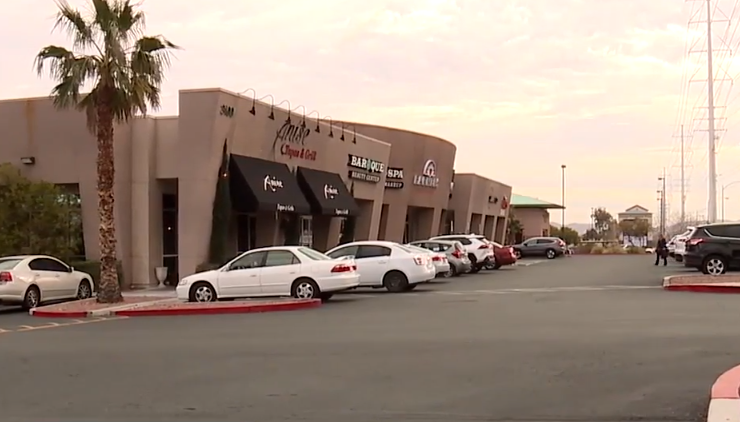 Anise Tapas and Grill, a kosher restaurant on Durango near Desert Inn, was shut down January 15 with 51 demerits and two imminent health hazards--a multi-generational cockroach infestation and sewage. When Darcy went to get their side of the story, an employee said, "No, it's a new restaurant. It's not Anise anymore. It's a different one." That’s news to us! Still says Anise on the sign and the re-inspection--a 6-demerit A grade they got two days after being shut down. First and foremost, let’s focus on those 51 demerits. Inspectors found cockroaches living behind the wall-mounted alarm system. There was a live one crawling on the refrigerator plus plenty of dead roaches and roach feces on walls and ceilings throughout the facility. There was also excessive grease, grime and food debris under and behind equipment and in floor drains, as well as large holes in walls and gaps in ceiling tiles. "It's disgusting before," said Owner/Manager Moishe Ben. Moishe Ben: Yeah, yeah, yeah. Darcy: You had a lot to clean up. Like a sewage spill where wastewater was flooding the place and foodhandlers were walking through it. Dishes stored as clean had old food debris on them, sheet pans of cooked eggplant and roasted peppers for guests to take were held at room temperature and a food handler touched ready to eat pita bread with bare hands. Cooked shawarma was being plated to serve to a customer at an unsafe temperature, raw chicken was stored over bread in the freezer and raw beef was stored above caramelized onions. Raw chicken skewers were held over ready-to-eat hummus in the make table. Food in the freezer was not covered, including meat left open to contamination and chicken, lamb and beef were being thawed for hours at room temperature. Now, let's get back to that "It's a new restaurant" thing. Darcy: They inspected on the 15th of January. Are you guys saying that none of you were here on the 15th? Darcy: Yes, we know that there was a re-inspection just a little bit ago. Moishe: Well I'm not open before. Now it's new. You have the owner before. Darcy: Okay, so you're saying that on January 15th it was a completely different team? Moishe: Yeah, yeah. Now it's new. Actually, not so much. We checked out his story with the Health District based on a line in their report noting an "Illegal change of permit holder." In a statement, the Health District confirmed, "The January 17 inspection was a re-inspection from the January 15 closure and not a change of ownership inspection... The new ownership was running the back kitchen the day of the closure (and came in on January 16 for a meeting of non-compliance). The old owner, who was running the front of the shop during the closure, is still maintaining a 33% ownership." So that story didn't hold water and Moishe should've known better because, as he pointed out, he's been on Dirty Dining before. Moishe: I have restaurant here 15 years and you come to me before. I know you. Moishe: 2007 you come to me. Shawarma Vegas. Actually, it was July, 2013 when Shawarma Vegas was on Dirty Dining. Darcy: Did you leave Shawarma to come here? Moishe: Yeah, I sell it. I sell it. Moving on now to our long list of other closures and downgrades--Little Caesars pizza on Nellis and Lake Mead was shut down January 14 for a pest infestation. In this case it wasn't roaches but an excessive amount of fruit flies. Inspectors saw flies on the clean kitchenware and ceilings above food prep areas and in a container of marinara sauce. They were also preparing food next to dirty dishes, storing a box of dough in the sink and kitchenware and shelves in clean storage were dirty. Little Caesars was back to a zero-demerit A grade on January 16. The person in charge at the restaurant said it was not dirty and the fruit flies were not everywhere. She disagreed with the health inspector calling it an infestation. She says there was nothing gross or unsanitary. Kimchi Korean BBQ restaurant at the Gold Key shops on Las Vegas Boulevard near Convention Center Drive was shut down after failing re-inspection January 16 for a multi-generational cockroach infestation. Roaches were found inside the steamer cabinet, behind equipment on the hot line, on prep kitchen walls and near the dish machine. Inspectors also noted an accumulation of grease and food debris. Kimchi was back to a zero-demerit A grade on January 18. The owner says they've filled every hole and sealed up all potential pest entry points as part of a comprehensive pest control program moving forward. He says they took out all equipment for a deep clean and got specialized treatment--including injecting chemicals into the walls--from two different companies. Liquor World on Blue Diamond and Durango had to shut down its sampling on January 18 because of no hand sink. The one that was there had been removed. No sampling was observed at the time of the inspection and the facility has since requested that permit be deleted as they have discontinued sampling at the store. No one returned our call for comment. King & I on Tropicana and Maryland Parkway is a four-time Dirty Dining repeat offender. It was shut down January 15 for failing re-inspection from a previous downgrade. They got a 37-demerit C on December 20. Inspectors saw the person in charge touch his face, hair and mouth with a gloved hand and continue touching equipment, containers and cutting boards. Many foods were left out at room temperature and chicken and spring rolls were uncovered in the freezer. The person in charge was eating on a prep table and food items in the make table made over a week prior were labeled with the current date as the prep date. King & I was back to a 3-demerit A grade on January 23. The owner said it's all good now. He blamed the problems on a misunderstanding with a new employee who's no longer there. He says the restaurant has been short employees and they're still looking to hire for one position in the kitchen. La Mexicana market take-out restaurant and bakery on Riverside Road in Mesquite were shut down January 15 for a multi-generational cockroach infestation. One was smashed under the cutting board and another was in the oven. There was also employee medication stored in a fridge above open cakes, cooked chicharones stored in a container on the floor and a foodhandler eating with gloves on. They were reinspected January 25. The restaurant got a 3-demerit A grade and the bakery got a zero-demerit A. The person in charge said it was a cleaning issue and all is taken care of now after a good and thorough deep cleaning. Panaderia la Asuncion bakery on Charleston and 15th Street was shut down January 16 for a multi-generational cockroach infestation. Inspectors saw roaches on prep tables, floors and walls in kitchen and the dining area. Also raw meat was not protected from contamination. Raw chicken was stored over salsa and raw beef over tortillas, cheese and cooked beef. They were back to a 3-demerit A grade on January 18. No one from the restaurant wanted to comment on the closure. Carlitos Cuban food and cafeteria on Maryland Parkway and Karen got a 38-demerit C grade January 17. A food handler picked up sandwiches that had fallen on the floor and did throw them out, but then used the same gloved hands to handle food. Pork thawing in a broken freezer was leaking onto an open box of crab legs, open sausages and shrimp. All had to be thrown out. Multiple food items were in the temperature danger zone including cooked pork, fish, carnitas, chicken, beans and rice. All that had to be thrown out, too, and inspectors noted it as a repeat violation. Multiple items in clean storage had dried food debris including utensils, pans and trays. Wooden spoons were splintered, pork was stored in a plastic grocery bag and tamales were stored in trash bags. When inspectors asked about 13 large containers of cooking oil in the back storage area, the owner couldn't say where they came from. The oil appeared to be in re-used containers. A note at the bottom of the report says, "At the end of the inspection, owner became hostile, yelling at inspectors and directing them to leave the property. Other staff members stepped in to diffuse the situation so the inspectors could finish their report." According to the Health District, Carlitos hasn't been re-inspected yet. We left a message with the manager for the owner, who did not return our call for comment.